Also with KOER test it said misfire detected great enough to damage the cat(which I pulled and checked and it’s perfectly fine). I’ve thrown a lot of sensors at it, because they were originally so it’s OK no big deal replacing them, it’s just money. Pics of old plugs attached, And mind you those plugs are only about eight months old. Like I said I replace them anyway. I’m about replace the whole dam distributor for the heck of it! Im really just Running out of options and would appreciate any help! This thing ran perfect for 3 years prior to the first hard misfire and replacing the cam sensor. Which it ran great again after the sensor was replaced for about a month, then one day all of this other started. STARTER DOESN'T CRANK ENGINE ? STARTER CRANKS ENGINE OVER, BUT ENGINE DOESN'T RUN? THESE TESTS SEEM OVERWHELMING, however this is what a Ford mechanic would do. So at least you know the procedures. Do what you can for now, starting with easiest. When pulling REF hose off, fine particles fell out of DPFE. Misfire codes don't tell you why your engine is misfiring, only that one or more cylinders are not running properly. The OBD II system tracks misfires by detecting subtle changes in the speed of the crankshaft via the crankshaft position sensor while the engine is running. A misfire causes a slight loss of speed in the rotating crankshaft, which the OBD II system logs as a misfire. A few misfires are normal, but if the engine experiences an excessive number of misfires within a given period of time, it will set one or more misfire codes. The last digit in the code indicates the number of the cylinder that is misfiring. Cylinder specific misfire codes (such as P0301, P0302, etc.) tell you that a specific cylinder is misfiring, but the code does not tell you why. 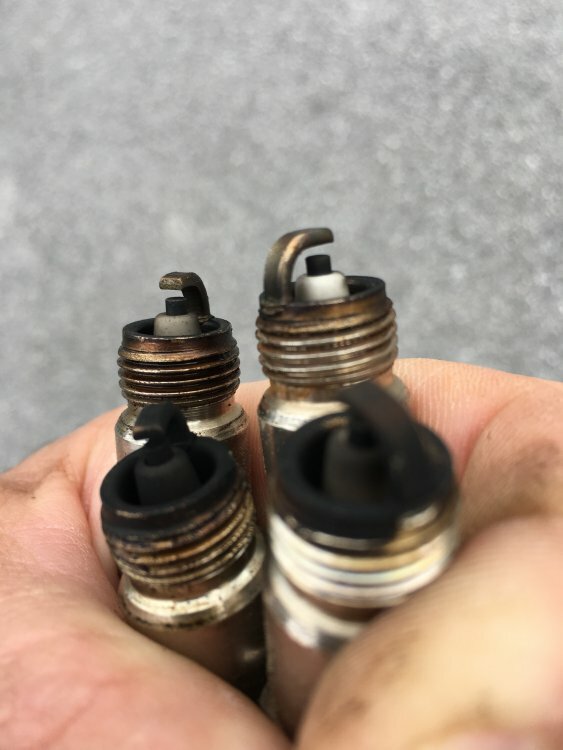 The cause might be ignition-related (worn or fouled spark plug, bad plug wire or coil-on-plug ignition coil), fuel-related (dead or dirty fuel injector; or injector connector dislodged or fouled), or compression-related (bent or burned valve or leaky head gasket). All of these possibilities must be investigated to rule out the cause of the misfire. Look at that VECI Label on top of radiator; look at the spk plug wire routing diagram carefully. The firing order for 1994 -1996 5.0Ls & all 5.8Ls is 1-3-7-2-6-5-4-8. 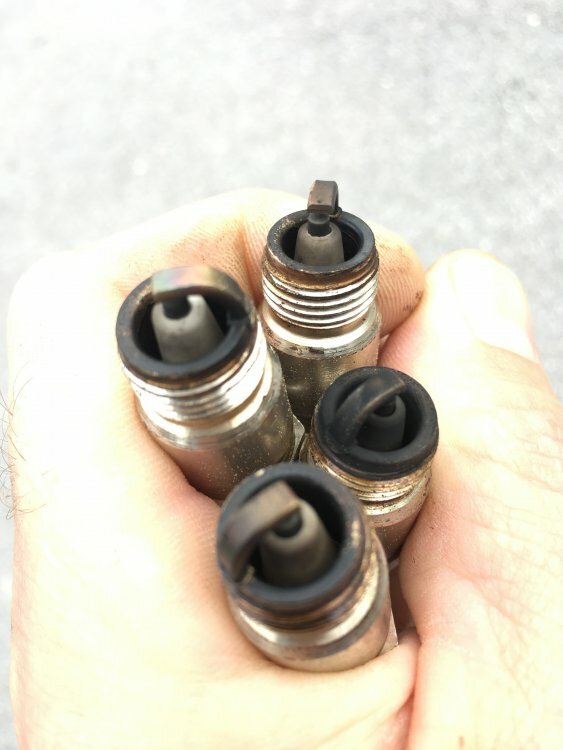 On these vehicles the #1 and #3, or #5 and #6 spark plug wires must be separated to eliminate the possibility of an induction crossfire. To eliminate the possibility of the coil wire becoming disconnected, route the coil wire under the spark plug wires at the distributor cap. Diagnostic Trouble Codes (DTCs) P0171 bank (1) (cylinder #1) and DTC P0174 bank (2) indicate the fuel/air ratio is too lean. miesk5 NOTE; FORD'S naming convention is that bank one is the same bank as where the number one cylinder is; sensor one and two are in the Y before the cat & sensor 3 is after the cat. Leaking fuel pressure regulator. Pull vacuum hose off, any fuel or aroma, replace FPR. Vacuum leaks. See my Vacuum leak test @ https://www.fullsizebronco.com/forum...odes-idle.html ... post #11. Restricted air inlet from atop radiator support through air filter through throttle body. Check air intake for leaks, obstructions and damage. Fuel purge system. Check vapor cannister, hoses to Vapor Management Valve (VMV) & TB. EGR, Leaking gasket. Stuck open EGR valve. Leaking diaphragm. Exhaust leaks before or near the HO2S's. Verify integrity of the PCV system. 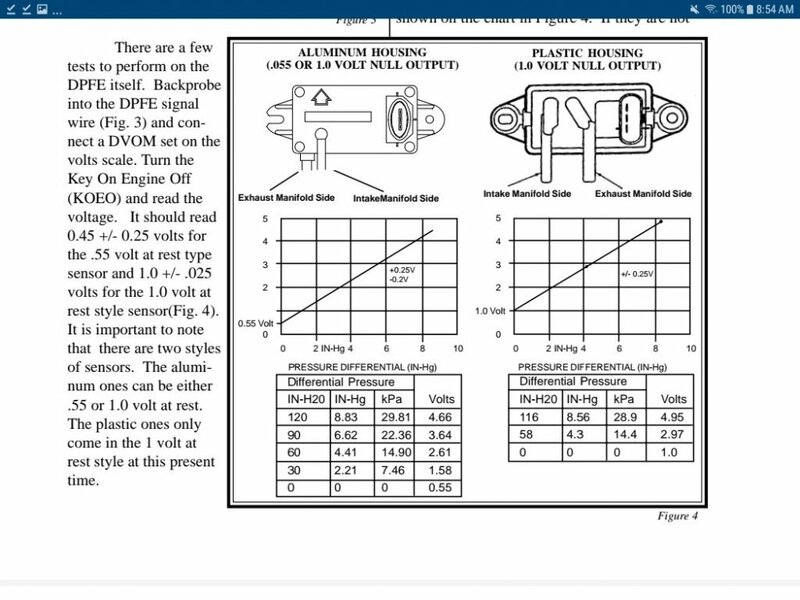 Check vacuum hose & valve itself. Are there any of the above concerns? Yes SERVICE as necessary. RERUN Quick Test. Disconnect fuel vapor hose from TB and plug fitting at TB. Start engine and run at 2000 rpm for 1 minute and return to idle. Enter Key On Engine Running (KOER) Self-Test. Are HO2S DTCs P1127, P1128 P1129, P1131, P1132, P1151 or P1152 present? Yes If DTC(s) P1127, P1128, or P1129 are present, GO to Section 5A, Powertrain Diagnostic Trouble Code (DTC) Charts and SERVICE those DTCs first. If DTC(s) P0131 and/or P0151 are present in Continuous Memory, SERVICE DTC P0131 or P0151 in the order they are displayed. GO to H27. All others, GO to H43. If DTC(s) P1132 and/or P1152 are no longer present, RECONNECT fuel vapor line. GO to HW43. The fault that produced the DTC is an intermittent. GO to Pinpoint Test Step Z1 with the following data: HO2S-11, 21 PIDs and list of Possible Causes. WARNING: THE FUEL SYSTEM IS PRESSURIZED WHEN THE ENGINE IS NOT RUNNING. TO PREVENT INJURY OR FIRE, USE CAUTION WHEN WORKING ON THE FUEL SYSTEM. Verify vacuum source to fuel pressure regulator. Start engine and idle. Record fuel pressure. Increase engine speed to 2500 rpm and maintain for one minute. Record fuel pressure. Cycle key on and off several times. Record fuel pressure. Is the fuel pressure between 30-45 psi (210-310 kPa)? Yes Fuel system is capable of required fuel pressure. GO to H44. No Fuel pressure out of specification. GO to Pinpoint Test HC. Cycle key on and off several times. Verify there are no external leaks (repair as necessary). Does the fuel pressure remain within 5 psi of the highest reading after one minute? Yes For DTCs P1130, P1150, P0171, P0172, P0174 and P0175: GO to H45. For No Starts: GO to H46. For fuel control DTCs displayed with misfire DTCs: GO to H47. All other DTCs: GO to H51. No No Excessive pressure loss. GO to Pinpoint Test Step HC3. Cycle key on then off several times. Turn key on and engine off, monitor fuel pressure gauge. Does the fuel pressure remain within 5 psi of the highest reading after 10 seconds? Yes For DTCs P1130, P1150, P0171 and P0174: GO to H47. No For DTCs P0172 and P0175: GO to H49. Locate a6nd disconnect the Inertia Fuel Shutoff (IFS) Switch. Monitor pressure gauge while cranking the engine for at least five seconds. Was there a pressure drop greater than 5 psi (34 kPa) while cranking the engine? Yes The EEC-V System is not the cause of the no start. REMOVE the fuel pressure gauge. RECONNECT the IFS switch. REFER to Symptom Flowcharts, Symptom Flowcharts, for further diagnosis. No, REMOVE fuel pressure gauge. RECONNECT IFS switch. GO to H47. Disconnect PCM. Inspect for damaged or pushed out pins, corrosion, loose wires, etc. Service as necessary. Note: This erases Continuous Memory DTCs. Install breakout box, leave PCM disconnected. Note: If misfire DTCs are displayed with the Fuel Control DTCs, use the misfire DTCs to determine the injector circuits requiring testing. Measure resistance between suspect injector Test Pin(s) and Test Pin 71 or 97 at the breakout box using the chart below. Is the resistance between 11.0-18.0 ohms? Yes Fuel injector and harness resistance is OK. GO to H50. No GO to H48. Breakout box installed, PCM disconnected. Disconnect injector harness connector at the suspect injector. Measure the resistance between Test Pin 71 or 97 at the breakout box and the VPWR pin at the injector harness connector. JIs each resistance less than 5.0 ohms? No SERVICE open harness circuit. REMOVE breakout box. 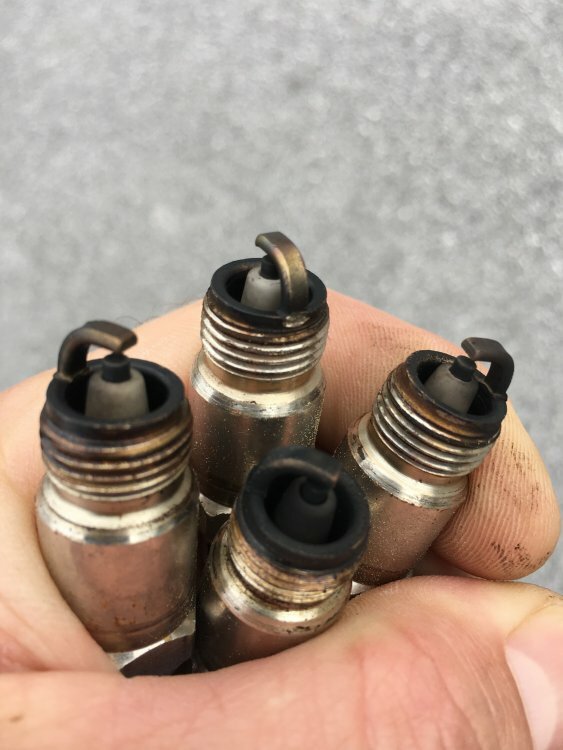 RECONNECT PCM and fuel injectors. RERUN Quick Test. Suspect fuel injector harness disconnected. Measure resistance between the injector Test Pin(s) and Test Pin 71 or 97, 24, 76 and 103 at the breakout box (refer to chart in H47). Measure the resistance between the Injector Test Pin(s) at the breakout box and chassis ground. Is each resistance greater than 10,000 ohms? No SERVICE short circuit. REMOVE breakout box. RECONNECT PCM and all fuel injector(s). RERUN Quick Test. Requires standard 12 volt test lamp. Connect PCM to breakout box. Connect test lamp between Test Pin 71 or 97 and each injector Test Pin (refer to chart in H47). Note: Properly operating system will show a dim glow at idle on the test lamp. Does test lamp have a dim glow while cranking or running engine? Yes REMOVE breakout box. RECONNECT PCM. GO to H51. No, No light/Continuous bright light. REPLACE PCM. REMOVE breakout box. RERUN Quick Test. Use the Rotunda Injector Tester 164-R3750, SBDS Injector Tester or equivalent to flow test the injectors according to the instructions for the injector tester. Is the leakage and flow within specification? Yes DTCs P0171, P0172, P0174 and P0175: The fault that produced the DTC is an intermittent. GO to Pinpoint Test Step Z1 with the following data: SF1, SF2, LFT1, LFT2 PIDs and list of possible causes. No REPLACE injector. RERUN Quick Test. Note: All Intermittent Procedures are used in conjunction with the Intermittent Symptom Charts and the Typical Diagnostic Reference Values at the end of the pinpoint. If directed here from another pinpoint test, refer to PIDs, circuits or components that were recommended or else refer to the Symptom Chart at the end of the pinpoint for the proper selection. Input Test - This test is used on sensing devices such as temperature, position, oxygen, etc. Output Test - This test is used on output devices such as relays, coils, solenoids, etc. Water Soak Test - This test is used on both input and output devices. Especially useful on spark plug wires, relays and hall effect sensors. Road Test - This test is used on both input and output devices. Four modes of engine operation are monitored for intermittent. Note: The electronic ignition (EI) system tester is not capable of diagnosing coil on plug (COP) systems. Ignition Test - This test is for non coil on plug only and used to diagnose the ignition system using the Electronic Ignition (EI) System Tester. Coil on plug applications will use the input, output, water soak and road test only. Select the next priority from the intermittent prioritization chart. Have you chosen an Intermittent Diagnostic Test procedure? Yes for the Input Test: GO Z10. For Output Test: GO to Z20. For Water Soak Test: GO to Z30. For Road Test: GO to Z40. For Ignition Test: GO to Z50. No To diagnose other driveability symptoms, GO to Symptom Flowcharts, Symptom Flowcharts. WARNING: USE CAUTION WHEN PERFORMING ANY OF THE TEST STEPS. ALWAYS BE AWARE OF HANDS, CLOTHING OR TOOLS NEAR COOLING FANS, ENGINE DRIVE BELTS OR HOT SURFACES. Connect Scan Tool to DLC. Access PIDs based on information from the pinpoint test or Intermittent Symptom Charts at the end of this pinpoint test. Go to the area of the suspected wiring or component fault. If input is a switch-type component, turn on manually. Lightly tap on component while viewing PID values. Wiggle and pull each component wire (Signal, Signal Return and VREF, if applicable) at the component. Look for abrupt changes in PID values. Compare the actual PID values to the KOEO Diagnostic Reference PID Values at the end of this pinpoint test. Are any PID values out of range or suddenly drop out and back into range? Yes Possible wiring or component problem. CHECK each wire for corrosion, bent or loose terminals and poor wire terminal crimps. SERVICE as necessary. Otherwise, REPLACE component. VERIFY repair. If unable to verify, REINSTALL original part and GO to Z11. Continue to monitor the information from the previous step. Turn ignition key to the ON position. Wiggle and pull each sensor wire (Signal, Signal Return and VREF, if applicable) from the component back to the PCM connector. Look for abrupt changes in PID values. Compare the actual values to the KOEO Diagnostic Reference PID Values. Yes Possible wiring or component problem. CHECK each wire for corrosion, bent or loose terminals and poor wire terminal crimps. SERVICE as necessary. Otherwise, if the value dropped out while checking the PCM harness connector and there is no evidence of a fault, REPLACE PCM. If unable to verify, REINSTALL original PCM. Return to Z1 and choose another procedure to follow. Unable to verify fault. No GO to Z12 KOER Wiggle Test. Access PIDs based on information from the pinpoint test or from the Intermittent Symptom Chart. Lightly tap on component while viewing PID values. Also wiggle and pull each component wire (Signal, Signal Return and VREF, if applicable) at the component. Look for abrupt changes in PID values. Compare the actual values to the HOT IDLE Diagnostic Reference PID Values. Yes Possible wiring or component problem. CHECK each wire for corrosion, bent or loose terminals and poor wire terminal crimps. SERVICE as necessary. Otherwise, REPLACE component. VERIFY repair. If unable to verify, REINSTALL original part, and GO to Z13. No GO to Z13 for PCM wiring check. Wiggle and pull each component wire (Signal, Signal Return and VREF, if applicable) from the component back to the PCM connector. Yes Possible wiring or component problem. CHECK each wire for corrosion, bent or loose terminals and poor wire terminal crimps. SERVICE as necessary. Otherwise if the value dropped out while checking the PCM harness connector and there is no evidence of a wiring fault, REPLACE PCM. If unable to verify repair, REINSTALL original PCM and RETURN to Z1 and choose another procedure to follow. No Unable to verify fault. RETURN to Z1 and choose another procedure to follow. Shes back on the ROAD! I had to just stick to the basics after trying to read everything you sent miesk5. It was just to much for a back yard grease monkey like me. It ran to good after the cam sensor was replaced then suddenly started miss firing again. The last thing I would have thought to check would have been anything related to the dizzy(since the cam sensor, rotor & cap, wires, and plugs was just replaced), but I decided to drop a new dizzy in and she’s up and running! BTW I figured out how to find #1 TDC(on the compression stroke). As follows for you all that don’t have a helping hand and pulled the distributor before marking TDC! (like me) Also strangely I saw no markings on the crank that lined up with the pointer for TDC. Anyway here’s how to find TDC by yourself without marking It prior to pulling! 1. Remove what you need to on front of engine(included but not limited to)belt, fan etc. so you can easily access the crank pulley bolt. 3. I laid under the truck on a creeper and had the compression gauge facing me from the top. I slowly started moving the crank with a long breaker bar over and over until I saw the Compression gauge needle pump up. It only went about 5 psi up but I knew at that point I was on the compression stroke. Immediately stop! At this point you know the Pistons on its way up And more importantly on the compression stroke..its roughly about a quarter to Half the way at this point. 4. Get the right length skinny screwdriver And go back up top and remove the compression gauge. Now reposition your socket and breaker bar in one hand on the crank and screwdriver in the spark plug hole touching the top of the piston in the other hand. Continue slowly moving the crank clockwise feeling the screwdriver move up(Be careful here and don’t get the screwdriver wedged sideways). When the screwdriver starts to go back down, stop and just reverse it ever so slightly and you’re basically at TDC(or real close), plenty close enough to drop a dizzy in. 5. Obviously at this point you get your dizzy ready. Point The rotor button towards number one contact in the dizzy and ease it down in place. Once it’s seated adjust the distributor so it’s dead lined up on #1 and put cap wires etc back together. 6. Put all the other engine crap back together, spark plug, etc, fire it up and adjust the distributor until she’s purring like a kitten.